Background: Epigenetic modulations such as histone modifications are becoming increasingly valued for their ability to modify genes without altering the DNA sequence. Many bioactive compounds have been shown to alter genetic and epigenetic profiles in various cancers. Sulforaphane (SFN), an isothiocyanate found in cruciferous vegetables such as kale, cabbage and broccoli sprouts, is one of the most potent histone deacetylase inhibitors (HDACis) to date. 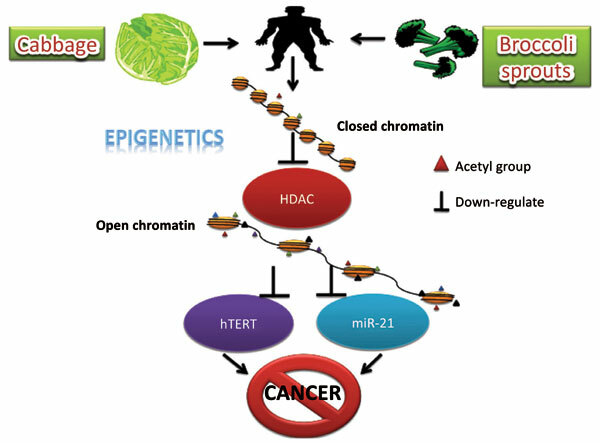 Recently, it has been identified that HDACis may play a vital role in regulating microRNAs (miRs) and human telomerase reverse transcriptase (hTERT). Objective: The aim of our study was to identify if aberrant HDAC, hTERT and miR levels could be regulated through novel dietary-based approaches in colorectal cancer (CRC) cells. Methods: We evaluated the in vitro epigenetic effects of SFN on CRC cells by MTT assay, cellular density assay, real-time reverse transcriptase-polymerase chain reaction (RT-PCR), cell cycle analysis, western-blot assay, HDAC activity assay and teloTAGGG telomerase PCR Elisa assay. Results: We demonstrated the inhibitory effects of physiologically relevant concentrations of SFN in both HCT116 and RKO CRC cells, and showed for the first time that SFN treatment decreased cell density, significantly inhibited cell viability and induced apoptosis in CRC cells. We also found that practical doses of SFN significantly down-regulated oncogenic miR-21, HDAC and hTERT mRNA, protein and enzymatic levels in CRC cells. Conclusion: Our studies suggest that the regulation of HDAC, hTERT and miR-21 is a promising approach for delaying and/or preventing CRC and may be accomplished via the consumption of SFN in cruciferous vegetables. Sulforaphane, epigenetics, histone deactetylase, histone deactetylase inhibitor, human telomerase reverse transcriptase, miR-21.